RunFit is proud to announce the 4th Annual Miles for Minds 5K Run, 5K Walk, Kids 2-Mile Run/Walk and Kids K. Mariposa Basin Park sets the stage for this year's event. Whether you run solo, with a friend or bring your family, office staff or school, we have an event for you! Register today and join in the fun! This is one event you won't want to miss! NOTE: WE WILL START ON TIME. YOU MUST BE AT THE START OF YOUR EVENT 10-15 MINUTES PRIOR TO THE ABOVE START TIMES. Late registrations for all events will be accepted at Packet Pickup. Note: If you are not able to pick up your packets in person at Packet Pickup, you must make arrangements for a representative to pick up your packet. Any out of town participants may pick-up their packet on race morning at the registration area (Mariposa Basin Park). ALL PARTICIPANTS WHO WOULD LIKE TO HAVE A POSTED TIME AT THE FINISH AND BE ENTERED INTO THE RESULTS AND BE ELIGIBLE FOR AGE GROUP AND OVERALL AWARDS MUST WEAR A TIMING CHIP/BIB. TIMING CHIPS/BIBS MUST BE WORN ON THE FRONT – OUTSIDE CLOTHING- OF PERSON. PLEASE USE DESIGNATED PARKING AREAS ONLY. DO NOT PARK ON ROADS AND/OR SIDEWALKS OR PEDESTRIAN BIKE PATHS. NOTE: AVAILABLE PARKING AT MARIPOSA BASING PARK. Bathrooms are available near start/finish. Start location for 5K Run, 5K Walk and Kids K is located at the Mariposa Basin Park. Participants must be on the field (start) by 8:45 a.m. in order to be ready for the 9:00 a.m. start. All participants will finish on the Mariposa Basin Park Field. Note: Kids K will start and finish on field. Each participant will receive a Race (Bib/Chip) number that must be worn on race day. DO NOT alter your race number in any way. Your bib number must be visible and worn on the front outside of all clothing during the entire race so that it may be clearly seen. Bib numbers are nontransferable and MUST be worn by the runner to whom it is assigned. Can I run with iPod/headphones? Yes. USATF, the national governing body of the sport, recently amended its ban on headphones, iPods and similar devices. However, athletes competing for prize money are not allowed to use electronic devices such as headphones and earpieces. Can I run with my Garmin GPS or my Nike Plus device? Yes, participants may wear their Garmin GPS watches and/or Nike Plus devices. However, these items do not count as “second timing devices" and will not be recognized by the event as official times or distances. What is NOT allowed on the course? The use of video devices, cell phones, computers, cameras or any similar devices by participants in the event is prohibited. The use of wheeled devices by participants or any other person authorized to be on the course shall be strictly limited to: (a) authorized and registered competitive wheelchair participants; and (b) authorized course marshals on bicycles. Baby joggers, baby strollers, skateboards, rollerblades, unauthorized bicycles or any other wheeled device will not be permitted. Do you have a Lost & Found in case I lose something at the Event or on the racecourse? Yes. We will have a Lost & Found for items that were lost and found on race day. If you are missing a personal item, please call: 505.217-4774. I am injured and/or cannot run the event (family commitment, work obligation, etc.). Can I get a refund, donate my entry or transfer my entry to someone else? No. Sale and/or transfer of race entry/bib are strictly prohibited and will result in the disqualification and/or banning of any individuals involved from future events. All entry fees are non-refundable and cannot be deferred toward a future event. If I provide medical documentation of my injury or pregnancy, will you give me a refund? No. Please refer to our official event rules and guidelines. Can I defer my entry to the next year if I am unable to run this year? No, participants cannot defer their entries to the next year in the event that they are unable to run. Can a friend pick up my packet for me if I cannot attend Packet Pickup? Yes. Your friend can pick up your packet for you. For everyone’s safety baby carriers, baby backpacks, inline skates, motorized scooters, bicycles, skateboards, and animals of any kind are prohibited from the course. Strollers and baby joggers are permitted on the course. Strollers and baby joggers must start at the back of the pack and your child must be secured in the stroller at all times. Weather forecasts will be monitored prior to the event paying special attention to the possibility of heavy rain, thunder and lightning, high winds and extreme temperatures. If necessary, athletes will be made aware of these predictions on the RunFit website: www.irunfit.org so that participants can properly prepare for severe weather during the race as well as possible course alterations. Severe weather updates will also be sent to participants via email as necessary. The Race Director will monitor the weather and make a decision if any action will be taken to modify the race. Possible changes include: altering the start time for the race or in extreme situations, cancellation of the event. Please listen closely to all public address announcements at the starting line of the race. Visible lightning will cause the race to be postponed for a minimum of 15 minutes. Additional sightings will continue to delay the race in 15-minute increments. If extreme heat is predicted, extra water will be provided to the athletes, prior to, during and after the event. The medical team will be alerted that athletes may require additional medical attention during and after the event due to the high temperatures. Medical staff members will be ready to assist you at any time. Radio communications personnel will be positioned at every aid/water station along the course. The event officials have the right to withdraw any runner from the race that appears in distress or at risk. If you have a health or medical problem at the Finish Line, you will be directed to the Medical Area located near finish. Please cooperate if you are asked to go for a checkup. If you feel that you need help at any point, please ask for it! If you are unable to finish the race for any reason, please notify a race official of your bib number so that the medical personnel are aware. All participants will finish on the Mariposa Basin Park Field (north). The overall and division award winners will be announced at the Awards Ceremony on race day – immediately following the Kids K.
Overall prizes will be awarded to the top three men and women determined by gun time. Age group prizes will be given to the top three finishers in the following categories for men and women: 5 and Under, 6-7, 8-9, 10-11, 12-13, 14-15, 16-19, 20-24, 25-29, 30-34, 35-39, 40-44, 45-49, 50-54, 55-59, 60-64, 65-69, 70+. Award times will be determined by gun time. All registered participants (12 and under) are eligible to participate in the RunFit Kids 2-Mile Run/Walk. The start of the RunFit Kids 2-Mile will begin at 9:45. Start and Finish is located on the Mariposa Basin Park Field (north). All participants will receive a special recognition award at the finish. All registered participants (12 and under) are eligible to participate in the RunFit Kids K. The start of the RunFit Kids K will begin at 10:15. Start and Finish is located on the Mariposa Basin Park Field (north). All participants will receive a special recognition award at the finish. Post Race refreshments will be held near the finish. Decide where your family and friends can cheer you on when you most need the support. Note: Please cut and paste link into browser. The Miles for Minds is fortunate to have some of the friendliest and hardest-working volunteers around. Volunteers help us on race morning to ensure you feel welcomed, are fully informed; have a safe, successful and positive running experience, and more! When you have a chance, give hearty, fun-loving thanks! 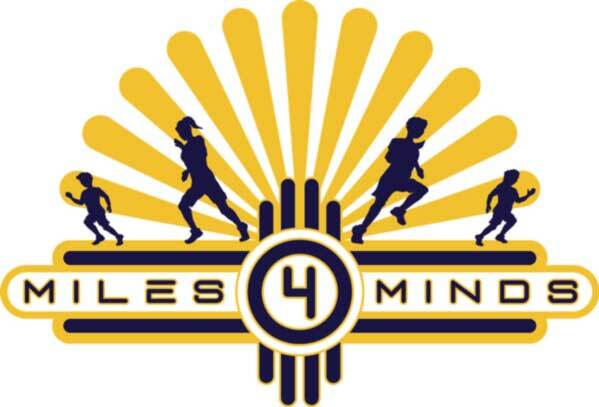 RunFit is proud to bring to Albuquerque the Miles for Minds 5K and Kids K to promote the education of our children’s body and mind. We have teamed up to fight childhood obesity in APS and further educational opportunities with all students!